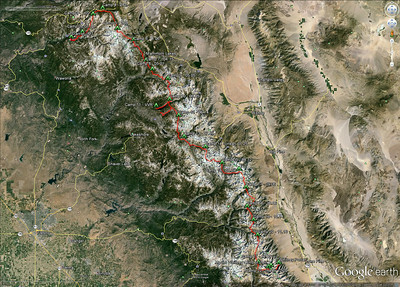 The John Muir Trail, aka JMT, has been on my hiking hit list for a while. 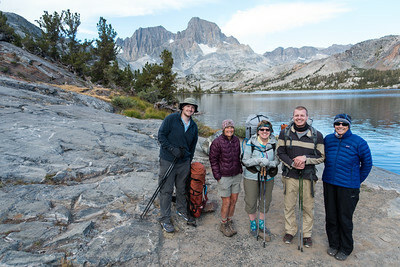 Due to the length and time to hike it, plus a few days to acclimate to the elevation up front, we did not seriously consider it until this year after Gina read “Almost Somewhere, 28 days on the John Muir Trail” and proclaimed she was up for it. We applied exactly 6 months in front of the date we wanted to start and actually got a reservation on the first try (albeit not for the traditional start point). Once we arrived, we amazingly were able to get a walk-up permit to start at the official start point AND be able to climb Half Dome. We were incredibly fortunate that both boys wanted and were able to do the hike with us. Kyle just recently started his first post-college job and with Ryan recently starting to work remote it did not seem likely but they were both able to make it happen – thanks guys, you really don’t know how much it means to mom and I to be able to share this experience with you! Planning for this was a bit different than the Wonderland trail. You only have to state where your first night will be. 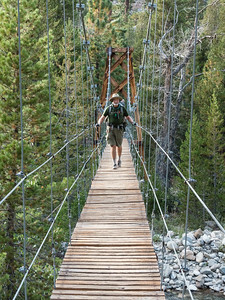 After that you are on your own and can camp anywhere you want (away from the trail and avoiding a few exclusion zones). We planned a 21 day itinerary that we wound up changing to 23 days (adding Half Dome and a side trip to Vermillion Valley Resort for a short relaxing day mid trip). Because Half Dome is done on the second day of the trip, and takes about half a day, my carefully constructed plan was immediately thrown off. We wound up winging it and later synchronized our plans with Ken & Jen’s (more on them later). 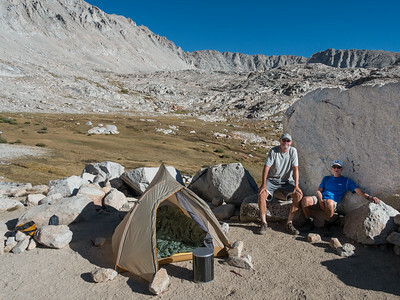 Jen had hiked the JMT last year so her plan had actual experience factored in, something you can’t get from profile spreadsheets and topo maps at home. This year everyone was fully responsible for planning, packing, and carrying their own food. I spent hours with spreadsheets figuring calories and making test meals, Gina just went to the store and bought what looked good. The kids did a combination of both approaches. A JMT downside is that you must carry a bear canister for most of the trail (and those portions that don’t require them have lousy options for doing a safe food hang). We invested in a custom 12″ Bearikade canister (expensive but the lightest option) and rented 3 more – a 10″ Weekender for Gina and two 14.5″ Expeditions for the boys. 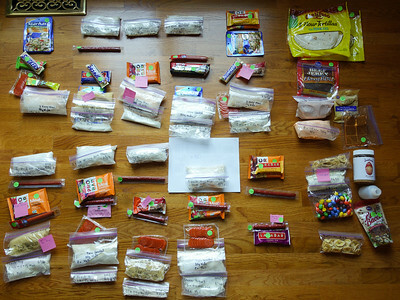 The first half of the trail is wonderfully easy for food planning as there are options for mailing a resupply every 3-4 days. 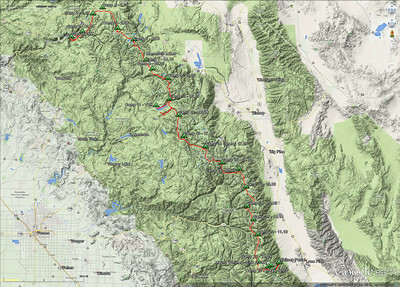 The second half is the opposite with the last mail-able resupply point being 115 miles from the end of the trail. That means we had 9 (later to be 10) days of food to carry out of the last resupply, and it all had to (or should) fit in the bear canister. 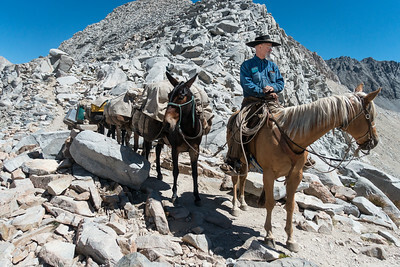 We resupplied at Tuolumne Meadows, Reds Meadow, and Muir Trail Ranch (MTR). 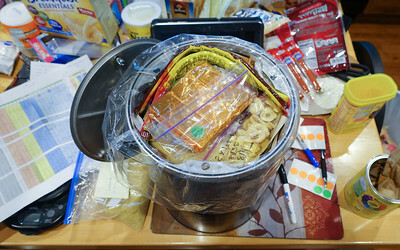 We opted for typical freeze dried food, tortillas, and tuna packets for the first half as they are not very space and/or weight efficient. The second half was basically a collection of various powders and flakes along with high calorie/oz, i.e. fatty, meats like pepperoni. My plan was to have 3 bases – mashed potatoes, couscous, and mac & cheese plus three “toppings” of tuna, pepperoni, and bacon bits/jerky. It worked out pretty good but I will definitely be trying some home dehydration and pack-it gourmet fare next time after sharing some meals with Ken & Jen. I was a bit worried about “hiking hunger” setting in since this was our first > 2 week backpack trip. There were a few nights where I could just not eat enough (ever eat 7 servings of mashed potatoes and still be starving?) but I wound up actually eating a lot fewer calories than the 3200 per day I packed. My goal was to not lose weight but I did lose about 4 pounds (this was after several days of large post-hike meal replenishment so it was probably 6+ pounds). Gina and Kyle both lost about the same, Ryan lost a whopping 12 pounds even though he had the most food packed. After years of searching, I am finally happy with a camera for backpacking – the Sony RX100 Mark 3. Good battery life and lightweight/inexpensive extras, in camera battery charging, great image quality, fast lens, built in neutral density filter, panorama mode, and decent in camera HDR. I took a Bushnell Solar Mini-wrap charger but also had 6 extra batteries just in case. For the first half of the trip, I just used a single battery – the solar charger would collect enough energy during the day to recharge each night. Once we turned south, i.e. the solar charger was not facing the sun on the back of my backpack all day, it could not quite keep up but I was also not in power preservation mode by that point. I never used 4 of the extra batteries, i.e. 3 total would have been enough for 3 weeks. 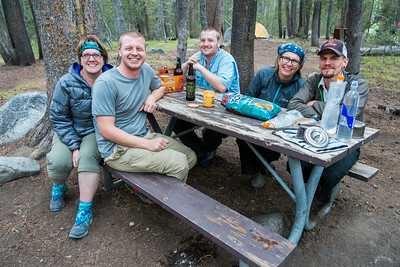 Multi-week backpacking trips give you the opportunity to meet folks from all walks of life. Some you just meet once on the trail, others you may play leap frog with and see several times. 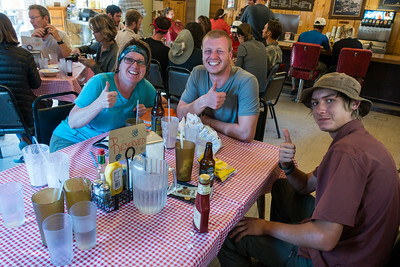 Every now and then you meet up with some folks that are doing the trail on a similar schedule, share a lot of common interests, and are simply enjoyable to hang out with at the end of a long day of hiking. Ken, Jen, and Yelly fell into that latter group. We met and connected with Ken and Jen early in the hike and at Reds Meadow decided to synchronize our plans and camp together each night. Yelly joined our trail family at VVR. 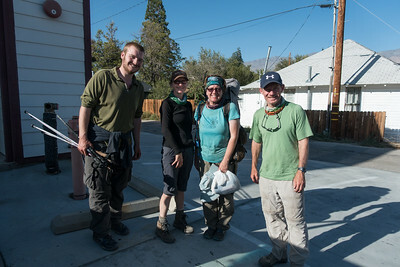 We also met a number of other wonderful people on the trail (pictures below) that all added greatly to the experience. The social experience of doing a hike like this is hard to put into words. We became known as the “Ohio Family” or just “Ohio”. Indeed, out of all the people we met, we were the only full family doing the hike together. Everyone had their own interesting stories and motivations for doing the hike. I find it amazing that every day I see numerous strangers as I live my life but on the trail, there is no such thing as a stranger. Everyone that is there is doing the same thing as you and you instantly have a connection. When near roads or day hiking locations, there is an unseen barrier between “them” and “us” (that might be related to our odor more than anything). 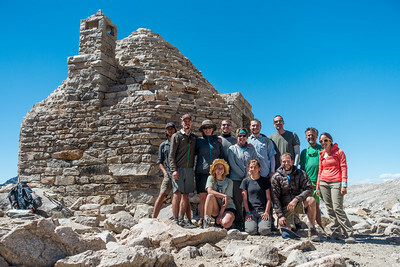 But this all reinforces that you are in this together with those you meet on the trail, even though you may only see each other a few times over the entire hike. Even age drops out of the social interaction equation. We met people from their late teens to 60s/70s… and connected with them all in ways that just don’t happen in the “real world”. Life on the trail is also hard to put into words. Everything is simplified to a level most people cannot truly appreciate. 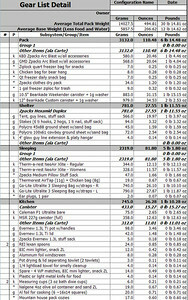 For 3 weeks our worldly possessions consisted of the 12.9 pounds (plus food) on our backs. Gina and I would get up at 5:30-6:00 AM, pack up camp, eat a quick bar or bag of cold oatmeal and get started ahead of the boys. Ken and Jen would often get up at 4:30 and be on the trail or ready to depart about the time we woke up. Sometimes we would hike alone but usually in pairs. At confusing points on the trail, whoever got there first would make a stick arrow to indicate which way they went. If the front runners found a nice camp off the trail, they would leave a 4 rock cairn and stick arrow. We all had Brooks Cascadia shoes so we would look for each others footprints to get a quick reassurance that we were all on the same path (alas, half the people doing the JMT/PCT must wear these shoes as several times when I was in front I’d see Cascadia footprints). Gina and one of us would often get a head start on some of the big climb days so we would look for a little size 8 print mixed in with a size 11, 13, or 14 one to get reassurance that Gina and her partner were still in front. We would usually have a prearranged mid-day meet spot (often the tops of passes) to eat lunch, take a nap, etc. The sense of time passage is not by a number changing on a cell phone but rather by physical changes. Wake-up time was marked by the cold and still pre-dawn dimness, perhaps with a nearby mountain top just starting to be bathed in light. Time to start hiking was a clear presence of the sun, but usually still obscured by a mountain, and the cold becoming a shivering cold that encouraged you get going and not just linger at camp. While the mornings were usually cold (with frost a few times and iced condensation in the tents), this quickly gave way to warmth as soon as the sun hit you. At that point the sun screen goes on the face/neck/hands, the wind shirt comes off, and you know that it is 8-10 am. Mid morning also usually marked the hardest part of the day, climbing above tree-line to work up and over a pass. Getting to the top of the pass meant the morning was ending and it would be afternoon soon with the sun inching its way towards its highest point. Coming down the pass meant full sun exposure for a few hours but just enough breeze would be present (usually) to not feel like you are baking. About the time you got back down to treeline, the sun would be heading back towards the horizon and you pick up the pace a bit to make sure you can find a nice camp area and not have to setup camp or eat in the dark. We would typically get to camp between 5 & 6PM, but sometimes as late as 7. After finding a spot for the tent, we would have a quick sponge bath while we were still feeling the heat and sweat of the day as it quickly gets chilly once the hiking is done. If all goes well, the tent is up, pads are inflated, and it is ready for sleeping with enough time left to watch the sunset on the mountains or the nearby lake. The gentle breeze that helped mitigate the heat during the day quickly dies off and leaves an eerie stillness. There are no crickets and few sounds. If next to a creek, you have a wonderful sound machine, otherwise it can be so quiet it almost hurts your ears. Eating dinner was a major highlight of the day as we would spend some time with Ken, Jen, and later Yelly (plus a few others if they were camped nearby). Food bartering and sharing was common. Gina would usually be offering most of her food and I was always worried we would get to day 7 or 8 out of MTR and she would not have anything left but somehow she did. 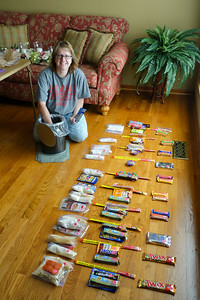 Jen’s home dehydrated meals were a big hit and fortunately she packed more than she could eat. Yelly earned the trail name Moocher for her ability to obtain extra food from others on the trail, including a couple full meals from a packed in resupply with an extra person’s worth of food. About two days from the end everyone knew how much food they would need so the tables turned and everyone was trying to get rid of food so they would not have to carry it up Whitney (Ken, Jen, Yelly – I have some bars left if anyone needs them ;-). Nothing went to waste, and we had little left at the end. After dinner we would brush teeth, pack up the bear canisters, and find a place for them nearby where they would not roll off a cliff if a bear played soccer with them (they never did). If it was a good horizon & sky, Ken, Jen, Ryan, and I would stay up to get night shots, otherwise everyone would go to bed and read or just reflect on the day before quickly passing out. Gina would say there was plenty of pain and suffering but in the bigger scheme of things we did good. Ryan had some knee pain early on but Jen (who happens to be a physical therapist) amazingly cured it with some PT magic and gave him advice that kept him pain free the rest of the trip. Kyle had a nice blister on top of a blister on top of a callus going on his little toe but Jen again worked her first aid wonders (I would have just amputated it to be done with it). With 15-19 pounds of food weight coming out of MTR, I was finally motivated to try and get to ultra-light weight for our gear. 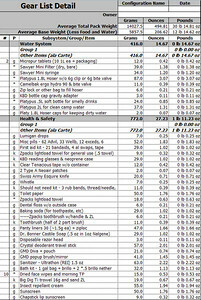 Minus the bear canister we were really close – about 11 pounds each for everything but what we were wearing during the day and food/water. Some of the big upgrades were a Z-Packs Duoplex tent (20 oz) and Z-Packs Arc Blast packs (19 oz). Those two items alone knocked about 4 pounds off each our weights. 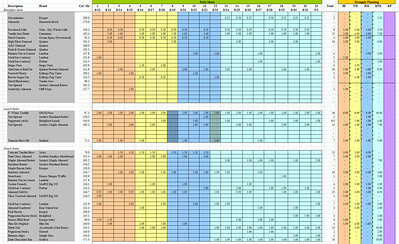 A bunch of other optimizations accounted for the rest. Going ultra-light is mostly about confidence in what you *really* need. The only thing I would change on our gear list would be to bring fewer camera batteries and add a pair of fleece gloves (1.25 oz). Our packs were about the smallest we saw on the trail and our weight coming out of MTR (29 lbs for Gina, 31 lbs for me) were substantially less than a lot of other packs we saw – many were in the 40+ pound range. Next trip we will try to shave some weight off our 27 ounce sleeping quilts. 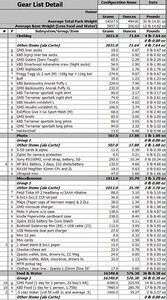 The full gear list of what we took is below. This was not an easy hike – the elevation definitely had an impact and the rocky trail made things tougher both on the ups and downs. But you get out of it what you put into it. For 23 days we saw some of the most incredible scenery imaginable. Pictures do not do it justice. We camped at or saw so many pristine alpine lakes that I can’t begin to remember them all. The variety of terrain, expansive views, length of being unplugged, and wonderful new friends made this an experience I’ll always remember. Thanks again to the kids, Ken, Jen, Yelly, and all the others we met for making this such a wonderful experience! Jen also has a gallery of great photos from the trip on her site. 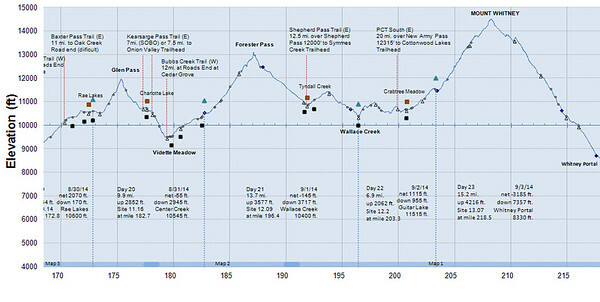 The JMT elevation profile with our camp locations (roughly), minus our side trips to Half Dome and VVR. The trail is about 221 miles plus we hiked another 10 or so in side trips. 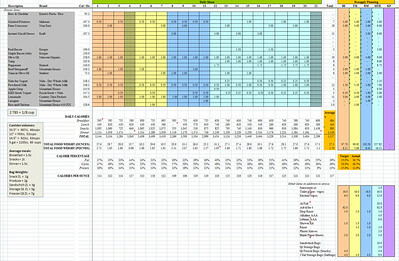 My food planning spreadsheet – I earned the trail name “Spreadsheet” because I was always pulling this out to see what I would eat for a given meal and keep track of what I actually ate. Our first evening with Ken and Jen at Tuolumne Meadows backpacker camp. 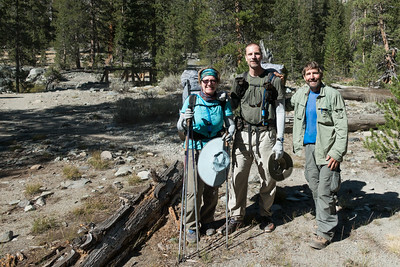 We met Ken a few days earlier after finishing Half Dome while eating lunch. We hiked the rest of that day and camped together that night but did not expect to cross paths again as he was meeting Jen the next day. They shared their site with us at the backpacker camp and we wound up doing the rest of the hike together. Meeting and spending 3 weeks with them was a major highlight of the trip! 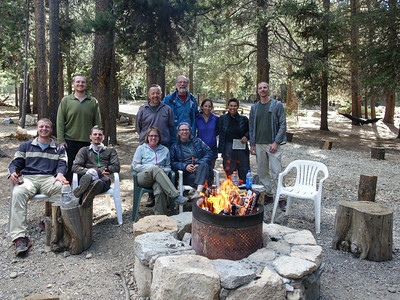 Mario, Phil, and Yelly (to right of Kyle in back row) at VVR – We met Mario and Phil the night before starting the hike in the Yosemite backpackers camp. Yelly joined our trail family at VVR and we stayed together for the rest of the hike.